Far too many contemporary animated movies are like fast food, easily digested and just easily forgotten. Then there’s the folks at Pixar, who never fail to impress me. Their latest feature, “Inside Out”, is an amazing achievement, for a variety of reasons. It’s a breathtaking ride into the realm of pure imagination. Its story isn’t easily encapsulated, and even if you do boil it down to one line- An 11 year old girl has to deal with the conflicting emotions inside her head- you can’t begin to capture its humor and depth (yes, a deep animated feature). Riley (voiced by Kaitlyn Dias) is upset that her dad (Kyle MacLachlan) and mom (Diane Lane) have moved her to San Francisco. Naturally, it’s a scary new life and experience. We also meet her emotions: Joy (Amy Poehler) used to be in charge. Now she’s on a trip with Sadness (Phyllis Smith) to recover Riley’s best memories, leaving Fear, Anger and disgust in charge of her life. So there you have it: “Inside Out” paints “adolescence” like you’ve never seen it before, with engaging characters, wonderful visual ideas, perfect voice work and the attention to detail that defines a Pixar movie. But perhaps the biggest compliment I can pay this film is that it takes chances. I can’t remember the last time I saw an animated feature that even attempted to touch on so many emotions. 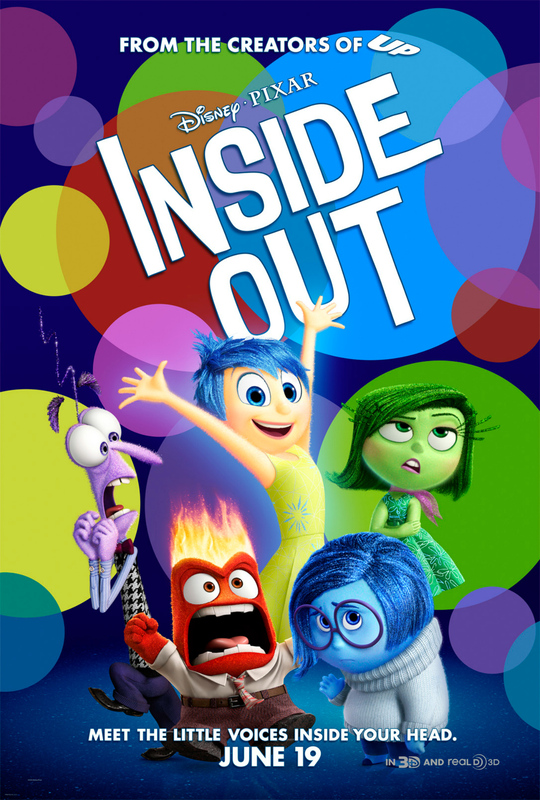 “Inside Out” does exactly that in less than 90 minutes. It’s easily one of the best animated movies I’ve seen in quite a while. Bravo!